Toys just keep getting more awesome every year - and are so much fun when adults want to join in on the action too! There are two RC toys on the Toys R Us hot list this year that will create a lot of joy (and laughter) from anyone who uses or even watches them in action - the Air Swimmers eXtreme from Animal Planet. Air Swimmers are little model airships or blimps, filled with helium, and a tiny little motor unit that drives it. When you operate your Air Swimmer, the toy runs so smoothly, you'll think you're in the middle of a giant fish tank or deep in the ocean instead of your lounge! To see Air Swimmers in action, do watch the Youtube video below - it really shows just how graceful these toy airships are. As soon as we saw this vid, we bought one for the office! Get Air Swimming this Xmas! The Air Swimmers eXtreme from Animal Planet should be filled with helium - you can get this done yourself at a party store that sells balloons or you can buy the handy helium tank when you purchase the toy from Amazon. This cool Christmas toy is weight balanced, so it won't rise upward too high or fall too low. It's simply amazing how easy this toy is to control, and how many hours of fun it provides. 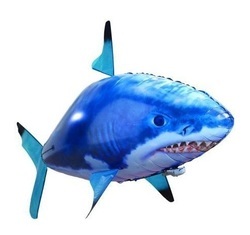 An Air Swimmer can change directions up or down, and through 360 degrees even from a distance of 40 feet! The nylon 'fabric' the toy is constructed from is strong and long lasting, and withstand impact against walls without damage. This toy is bound to be a huge hit at office gatherings, family reunions, birthday parties and as Christmas gifts. The Air Swimmers work through infrared technology, not Wifi. To operate it, you have to aim the controller lights directly onto the receiving pod of the Air Swimmer clown fish fish or the shark. When you want the air swimmer to move ahead, you just use the tail button. When you activate that, the tail moves back and forth from left to right to propel it forward, just like a real fish. You can go fast or slow depending on how you control the tail button. When you want the Air Swimmers eXtreme from Animal Planet to turn, you simply push the tail button the desired direction. Whenever you want the fish or shark to change altitude, you move the button to make it climb. When you want to lower the Air Swimmer, you use the dive button. You and your children will be delighted and amazed at the antics of this toy. 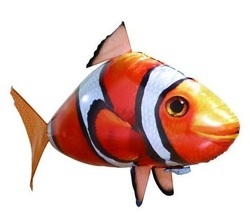 The Clownfish Air Swimmer is 57 inches in length and 36 inches in height, as is the shark. Like this top Christmas toy, but not quite taxing enough? How about a Bop It XT instead?